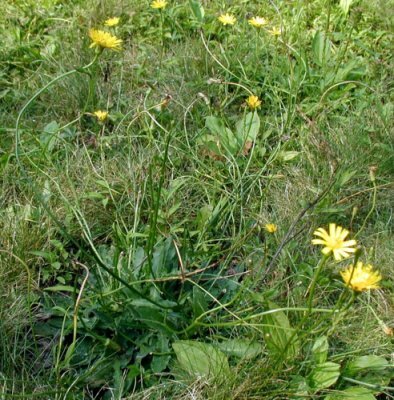 The last couple of wildflowers that I identified popping up in our lawn were introduced species, which means they’re not native to North America. You could call them aliens, or exotics. The main problem with introduced plants is that they often go wild, literally. Typically, no pests or predators consume enough of the plant or control it by other means, so the new kid on the block acts like an invader. Seeds are easily spread by animals, birds or the wind. Runners and suckers help the aliens invade new territory. Invasive plants crowd out native plants and the problem with that is that we lose biodiversity. A highly diverse ecosystem has been shown scientifically – over and over again – to be more stable than a less diverse ecosystem. What that means for all of us is that when we lose biodiversity we lose a little stability. When nature becomes unstable, bad things happen. So far, we’ve done some really bad things, like polluting the waterways so badly that a river actually caught fire in the 1970s and fish populations in the Great Lakes were totally decimated to recover some decades later. Enacting legislation, like the Clean Water and Clean Air Acts, to right these wrongs aided in the recovery. Looking at things long-term, one sees that it would be much better for us, as the human race, to strive to stabilize our environment. Perhaps an over simplification, but the endpoint is clear. We need to keep our environment of a high quality and stability if we are going to survive. Concerning plant invaders, the worst of the bunch has been identified and legislated against. The U. S. Department of Agriculture has compiled a list of links to federal and state noxious weed lists. I’ve seen many thistles growing by the roadsides in the country out here and probably at least a few of them are on this weed list. The Mile-a-minute and Loosestrife I’ve seen in nearby areas, but I only recall seeing the Kudzu vine in Virginia and places further south. We have Multiflora Rose growing all along the dirt road up to the house and I do think it grows very quickly judging from the last three years changes. We’re going to tear some out this fall and replace it with raspberry plants. 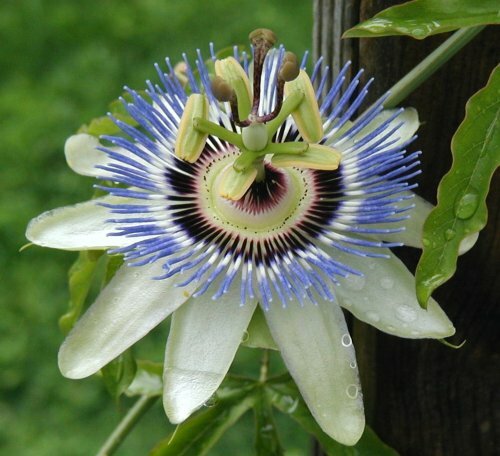 That way, we can still enjoy the flowering, have some delicious fruit for the picking, and help reduce the invasive plant burden on the Pennsylvania natives. 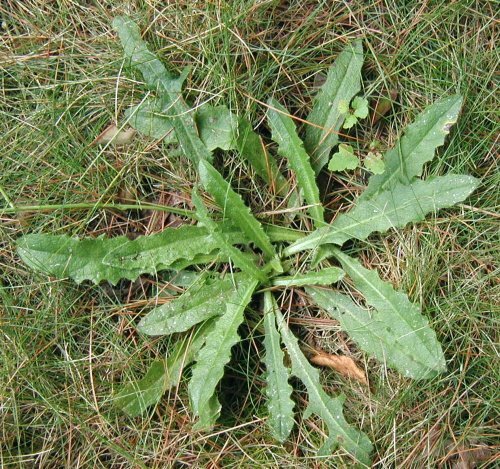 Where you live, do you see any of these bad weeds? I read an article in a recent Conservationist magazine, from New York State, that addressed an additional problem with Giant Hogweed. Some people are so sensitive to the plant that contact with it produces blisters. Kind of like the burns you can get from parsnips in the garden if you handle them with the morning dew still on them! If you’re going to get rid of some Giant Hogweed, send me a picture first and I’ll post it here for all to see. Oh yeah, wear long sleeves and gloves, too! We don’t take a lot of pains to keep a manicured lawn, not even in the front of the house. Being in a rural setting, we don’t have a neighbor’s neatly trimmed lawn right next to ours to make it look too long. Let’s just say the yard has a rough look to it! 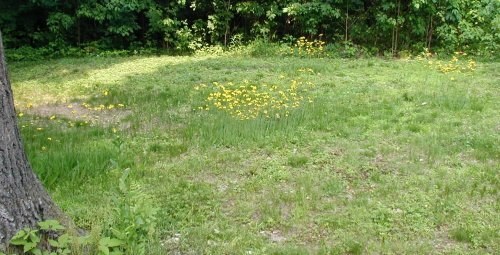 Besides saving time, money on gas and oil, and polluting the air less than the Jones, I’m having a little fun letting the wild flowers grow. I actually mow around the volunteer plants that look interesting or seem like they’ll flower. New wildflowers have been allowed to pop up through the thin grass. Some fleabanes have gotten five feet tall – as tall as a little peach tree that I transplanted last year – and there’s a few I have yet to identify. 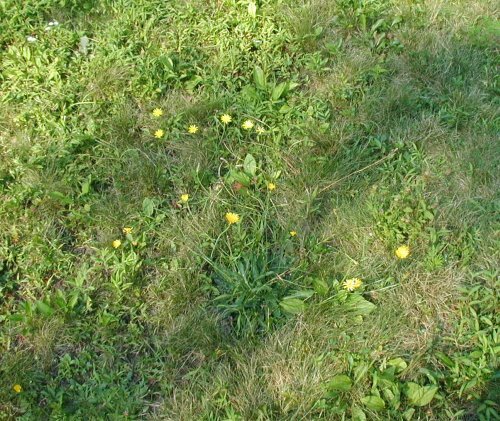 A couple of very similar looking “tall dandelions” appeared in the lawn and they have been saved from the cut of the mower – for now. These plants are composites, or members of the daisy family. Both of these plants have rather thick and fuzzy, or hairy, leaves arranged in a basal rosette. 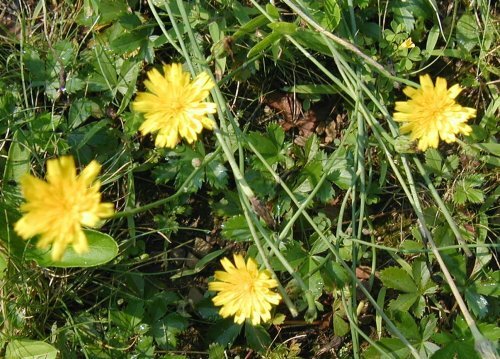 A single stem rises up from the basal leaves to a somewhat branched head having a few to several yellow, dandelion-like flowers. Looking down on this flower you might think it’s a dandelion, but on closer inspection the tall stem and the thick, hairy leaves tell you it’s not a dandelion. Photo, taken 26jul08, looking down on a dandelion-like, yellow flowering weed. From a side view the stems obviously come up from a single point. The stems themselves are thin and quite different from the hollow tubes of a dandelion’s flower stem. Photo, taken 26jul08, from Juniata County, Pennsylvania. Bright yellow flowers of a ‘hawkweed-type’ wildflower, taken 26jul08. Flowering of the two plants was separated in time by a few weeks. The taller of the two bloomed in June and the flowering of the shorter stemmed plant is just now petering out. Leaf shape and the arrangement of the flowers helps to identify each of these plants. Shorter stem with 2-5 branches each having a single flower. Leaves are lobed, but in a such a way that each leaf looks unique, and very hairy. 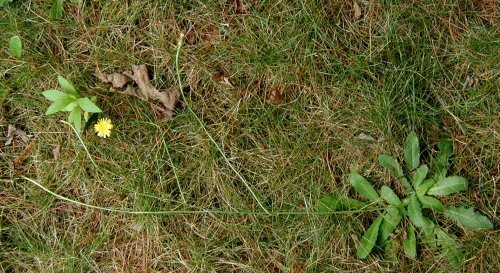 Stems reach up to 16 inches, but some stems may be half that tall. A few scales are scattered on an otherwise smooth stem. Identified as Cat’s-Ears, Hypochoeris radicata, an alien. Tall stem, 1-3 feet tall, with a group of flowers in a compact head. Untoothed, linear leaves are hairy on both sides. The stem and bracts have hairs as well, black ones at that. Identified as Field Hawkweed or King Devil, Hieracium pratense, an alien. Flowering during the first week of June the Field Hawkweed stands about 2 feet tall, as seen from across the backyard on 07jun08. 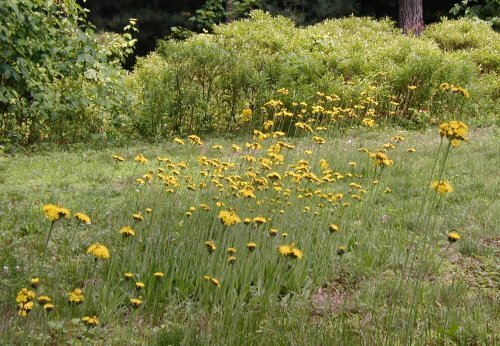 Taken last year (02jun07) this photo shows four large mats of flowering Field Hawkweed. Taken 20jul08, this photo shows the limited branching of the Cat’s-Ears stem that rises up from the rosette of leaves. In this case there were four terminal blossoms. Basal rosettes of hairy leaves of the Cat’s-Ears, taken 20jul08. Note the variety of lobe shapes on these leaves. 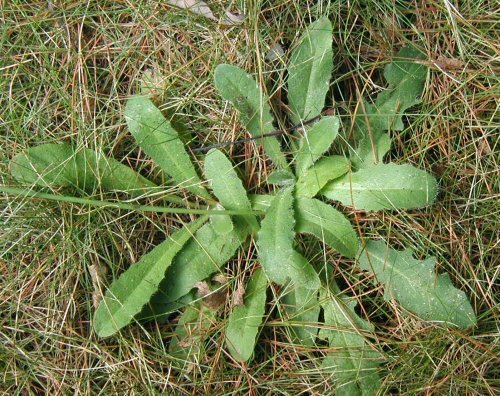 Basal leaves of the Field Hawkweed are entire and do not have lobes or teeth. 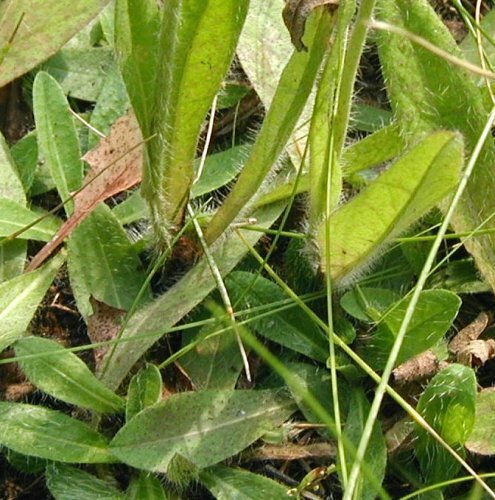 Field hawkweed leaves are quite hairy and the hairs are very noticeable. 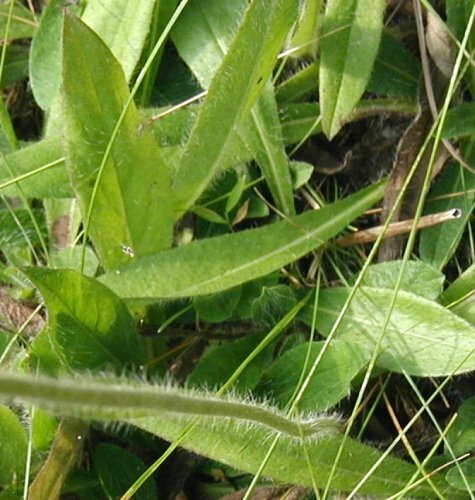 Close-up side view of a grouping of flowering Field Hawkweed, taken last year (02jun07). Neither plant appears to have any medicinal or edible value, but they do have ornamental value. When they’re done flowering, they’ll be mowed and looked for again next year. 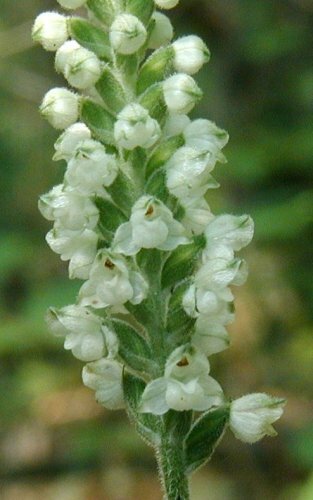 The Downy Rattlesnake Plantain started opening its blooms this week. Each of these orchids has a few dozen quarter-inch long blooms at the top of a fuzzy stem with about a third of the blooms open. You can see why this orchid is called ‘downy’ as all parts of it seem to be fuzzy with soft, downy hairs. Here’s a similar photo taken without a flash. Details of the open flowers are more visible. Three sepals are the same white color as the petals, except for a tinge of green at the sepals’ edge. The two upper petals are merged into a hood. The lower petal is enlarged into the typical cupped lip of an orchid. 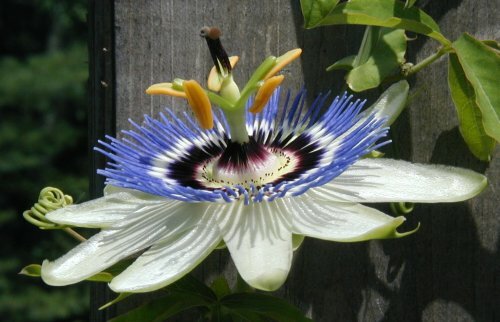 The Passion Flower blossom that opened the day before yesterday has now closed up, so the blooms are only open for a day or two. The bloom on the left is the finished one and that on the right is just now opening. Notice the spikes at the ends of the sepals. 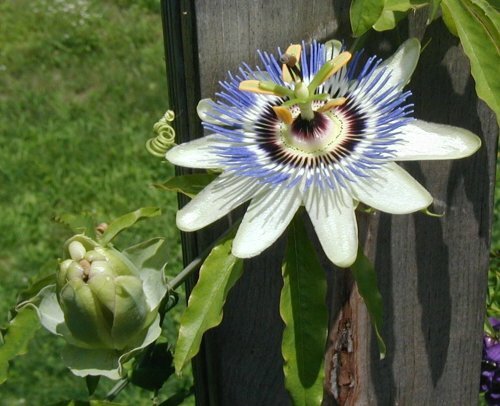 Sepals are white on the inside, which make the passion flower appear to have 10 white petals. I didn’t capture the action when the passion flower opened its blossom today, but it opened fast enough to shake the whole vine. 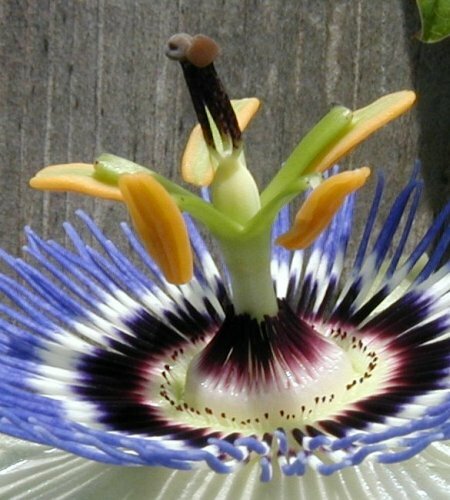 Five elongated, yellow-orange stamens contrast with the dark purple and light blue fringe. The brown-tipped purple stalks are the stigma and style female reproductive parts of the flower. 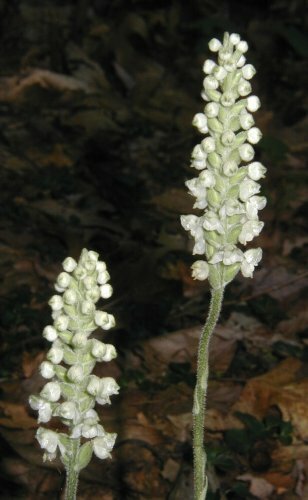 The stigma are sticky tips of the stalks, or stigma, which are tubes that lead the sperm to the ovary – the bulbous, creamy white structure – where the fruit will eventually develop. Well, we didn’t have to wait very long for the passion flower to open a bloom. The pictures I posted earlier today were taken on 20 July, three days ago. It’s been raining since last night and for the last few nights we’ve had some window-rattling storms. 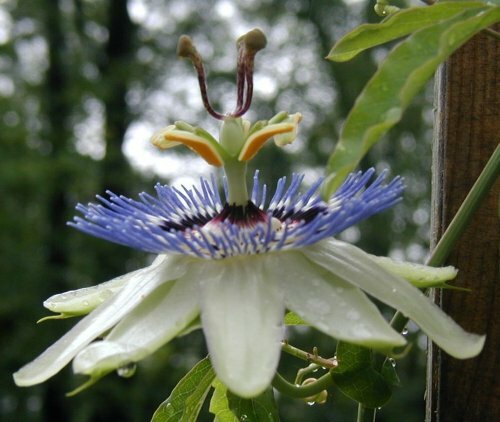 Maybe all the rain helped the first passionflower blossom open up today, 23 July 2008. 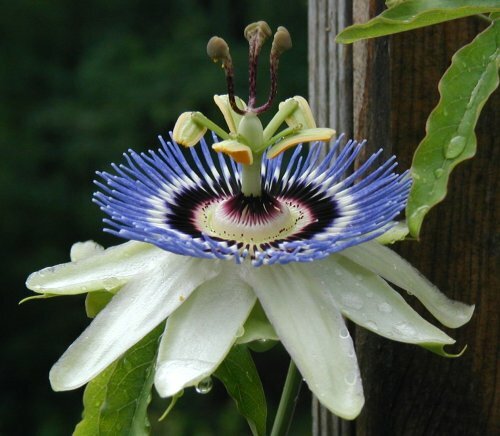 The common passion flower, Passiflora caerulea, is a large blossom, measuring nearly 3 inches across and almost as high. They’re very interesting with all that multi-colored fringe. 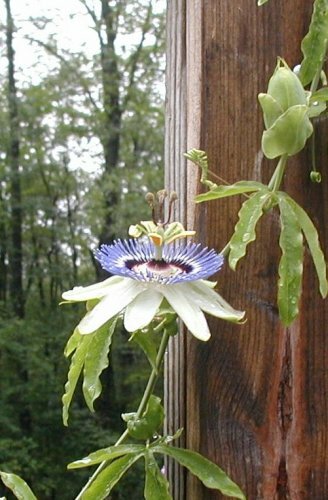 A friend collected a roadside passionflower a few years ago near the northern state line of Maryland, probably along Route 15. For several years he’s kept the plant going strong enough to take cuttings each Spring. I was a lucky recipient of one cutting that accepted RootTone’s magic and it started growing very well. 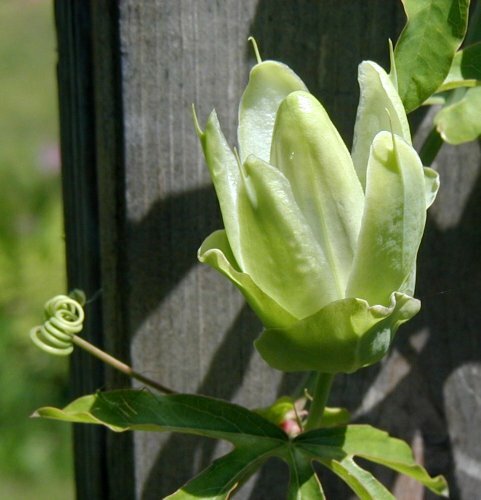 Palmate leaves of the passion-flower alternate along a vine-like stem with two small half-moon shaped leaves clasping the main stem. 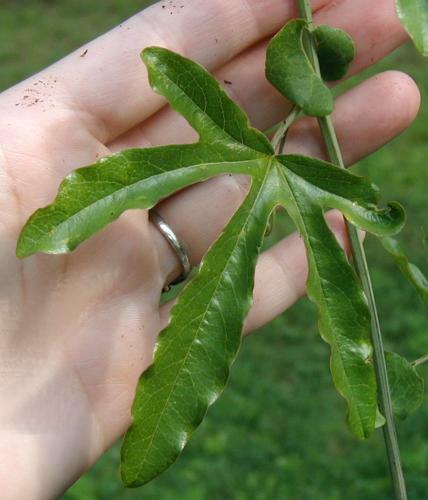 The palmate leaf fingers are skinny. At the leaf and main stem junctions tendrils coil out to anchor the plant to anything within reach. 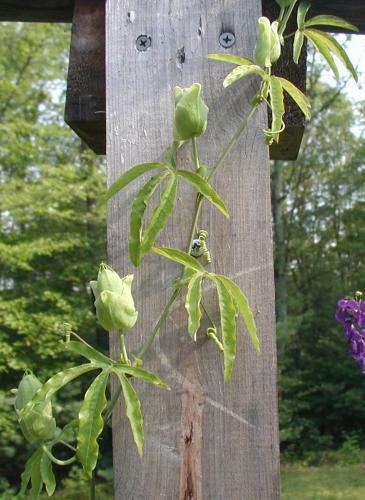 It would be important to trellis this plant to keep it growing where you want it to stay. I did not expect it to bloom the first year, but there are half a dozen blossoms already in development. Flowers rise up from the leaf axils, one blossom per leaf. I’ll get more pics when the blooms are out. Stay tuned! We’ve had some really hot weather lately, and with the nightly downpours, that was enough of an excuse that I’d stopped mowing the lawn for about a month. Yes, the grassy areas did get deep and I know I’ll regret it when I have to twice-mow that long grass to get it back into shape. But there’s a silver lining to that cloud – I’ve met a few more meadow plants! 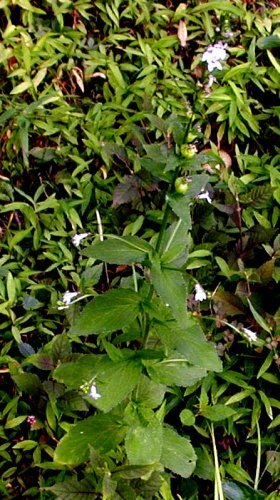 In the front yard we have Indian-tobacco, a type of Lobelia. I remember seeing it last year there, but didn’t take any pictures then. Indian-tobacco, Lobelia inflata, is the most common lobelia and it can be found along roads, at the edge of woods, and in meadows, like where the front yard meets the woods in our case. 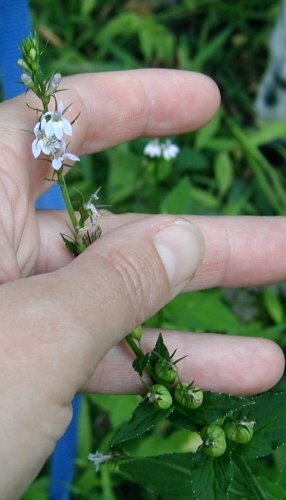 Lobelias are characterized by their flower shape, having five petals joined at the base so they form a tube, or corolla. Two upper petals can be thought of as ‘ears’ and the three lower petals as ‘lips’. 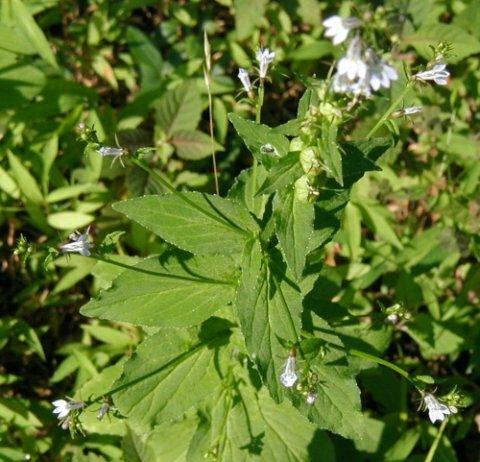 Different Lobelia species vary in their overall flower and leaf shapes, as well as the placement of the blossoms. 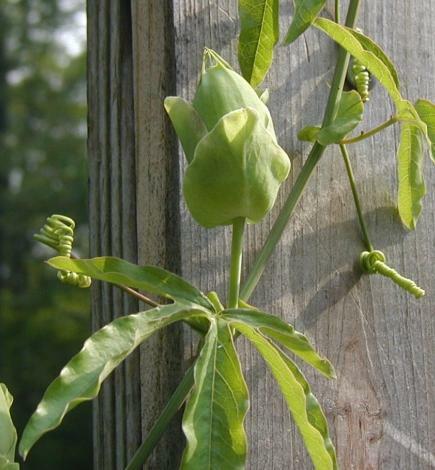 Flowering from July to October, Indian-tobacco has its flowers in the leaf axils. 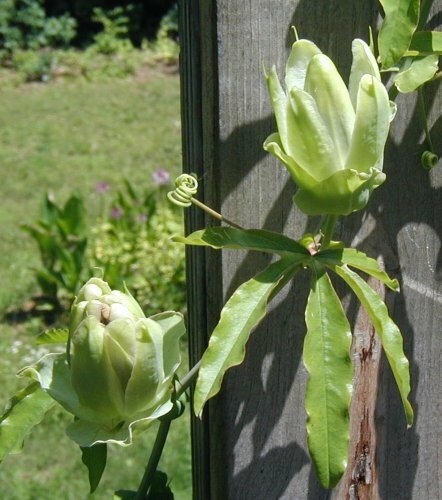 After flowering the blossoms swell at the base into pea-sized seedpods with the remnants of the flower sepals at the top of the round pods. 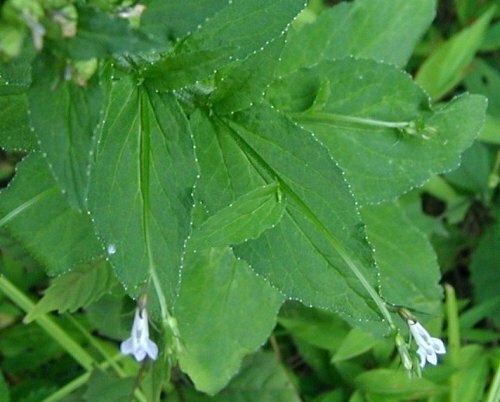 Alternating leaves are toothed, oval shaped, and larger than the leaves of most Lobelia, especially nearer the ground. Looking down on this common plant, you can see that blooms further down the stem are on longer stems that hang over the leaves. Further up the top of the stem the blooms are nearer the main stem, and at the top they’re right on the stem. You can see that flowers are blooming at the top and sides of this Indian tobacco. The bright sun blanched out the pale blue color of the flower petals, but you can see the progression of budding flowers to opened blooms to swollen seedpods. Last year I must have lopped off too many branches on a couple elderberry plants because this year they have only a few bare sticks and very little greenery. I hope they come back stronger next year or I’ll have to go hunting for more bushes if we want some elderberry jam. That shouldn’t be too hard as elderberry, Sambucus canadensis, grows wild all around Pennsylvania at the edges of fields and along roads. 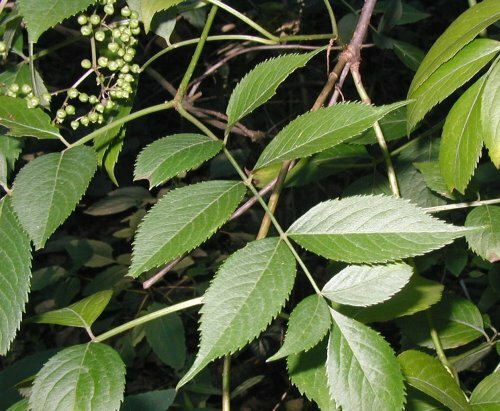 Pinnately compound, toothed leaves on branches that reach 10 or 12 feet tall will help you find them. The plants are easy to spot when in bloom, even from a distance, because of the broad clusters of white blossoms. 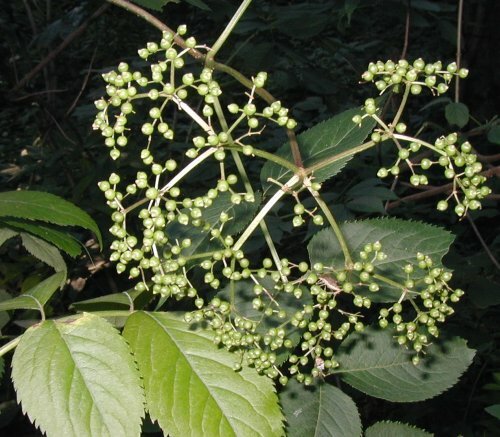 Once you find your elderberry plants make note of their location because they’re not as easy to find when in berry. Guess I should have mentioned that a couple weeks ago because the elderberries are growing fast with all the rain we’ve had. Elderberry branches are starting to get weighed down with their fruit, even though the berries are still green. Once they’re big enough the berries will turn a deep purple and then they’ll be ready to harvest.